InTouch Edge HMI is a customizable Human Machine Interface application with a compact footprint and comprehensive feature set that enables deployment on edge devices for both OEMs/machine builders and traditional SCADA users. Capable of creating intuitive, secure, and highly maintainable applications for any industry, InTouch Edge HMI makes it the ideal HMI for the Industrial Internet of Things (IIoT). It can deploy and run on small panel PCs, embedded devices and machines, and supports remote access on smartphones and tablets without any client installations. Whether you are looking for a core SCADA application to run your operations, or a light weight HMI for edge devices, InTouch Edge HMI offers the flexibility of both. The InTouch Edge HMI multi-touch interface allows development for any touch-screen enabled device. Use familiar touch gestures, like pinch for zooming and panning, or swiping to change screens or acknowledge alarms. InTouch Edge HMI includes four client deployment models for Full Runtime, Embedded View, CE View, IoT View, plus Thin Client capabilities. InTouch Edge HMI provides native integration with other AVEVA software applications such as System Platform providing a line of sight down to embedded machine-based small systems, Historian providing regulatory compliance, data storage and reporting, and Online Insight providing an intuitive cloud based information dashboard and trending tool. Includes native drivers to more than 240 communication protocols, covering all major PLCs, temperature controllers, motion controllers, bar code/2D/RFID readers and many other devices. Can connect to any SQL database (Microsoft SQL, MySQL, Wonderware Historian), or Microsoft Access or Excel, and ERP/MES systems. 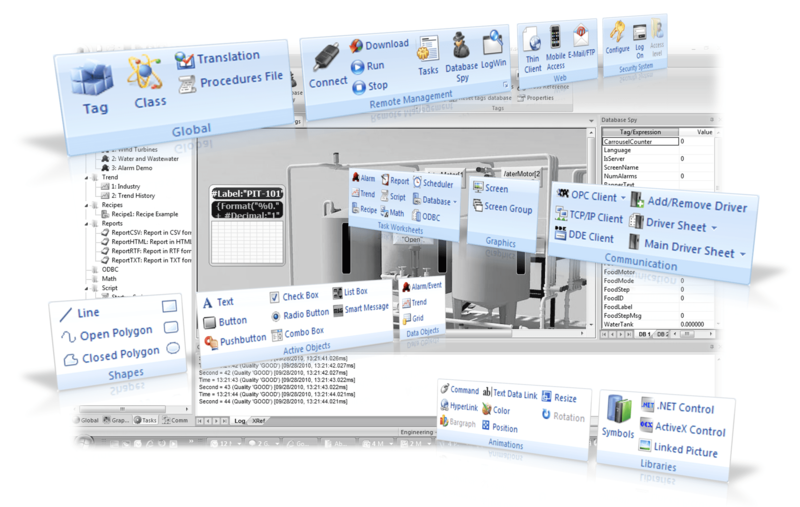 Convert whole applications from FactoryTalk ME/SE, PanelMate, or PanelBuilder 32. 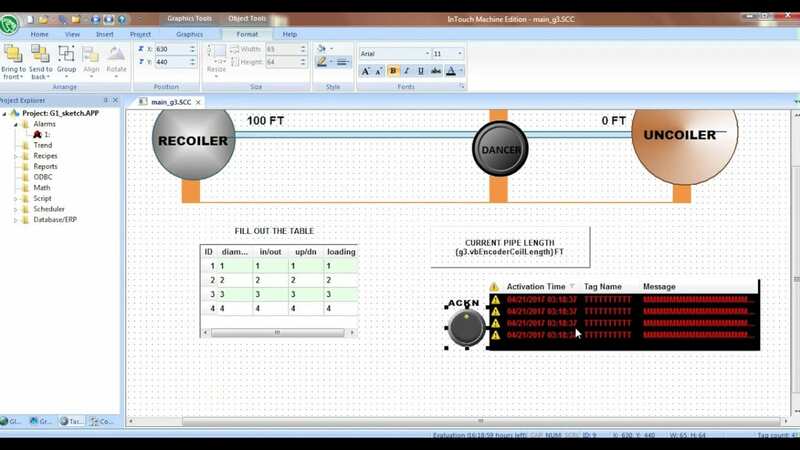 Save time in conversion from a previously designed application to an InTouch Edge HMI application. As part of the development environment, three pre-built template designs come included with InTouch Edge HMI – PackML, OEE and Andon designs. InTouch Edge HMI offers an unparalleled scalability for any project, whether robust SCADA for multiple sites, or a way to visualize data from low-end edge and embedded devices. InTouch Edge HMI offers licenses based on tag counts, or an unlimited license for tags and thin clients. The platform agnostic development environment allows you to create projects for all supported versions of Windows, Windows Embedded, Windows CE, Linux, and VxWorks. The HTML5 based Studio Mobile Access client also allows easy web publishing for read/write access to your application on the web, smartphones, or tablets. Not only does InTouch Edge HMI bring the ideal capabilities for any edge deployed HMI application, but it can be enhanced with the powerful AVEVA Insight cloud-based dashboarding and analytics tool for secure managed collection, storage, visualization, and analytics of industrial data for faster, smarter business decisions. Insight consolidates InTouch Edge HMI data for complete visibility into how your business is performing, and enables users throughout the enterprise to access data and information from anywhere.